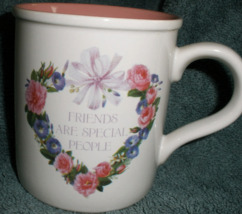 "Friends Are Special People" Mug New This is a Beautiful, Dainty, Mug Exterior: white with a Pink Rose Wreath in the shape of a heart Interior: Pink Very Nice Mug! No chips or cracks. 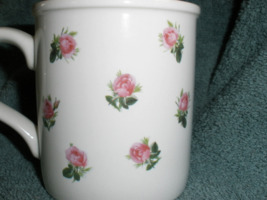 Review the above information on this item for sale: Pictures are of the actual item described, clear, sharp, and comprehensive. 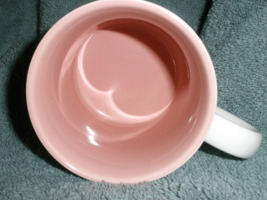 I take all Of the pictures – No stock photos from someone else. Descriptions are comprehensive, with accurate descriptions and pertinent information. All items sold “As Is”, as described. No returns on items where shrink wrap, plastic wrapping, or Tyvek strap has been removed, Or otherwise stated in the description. I am always willing to discuss any issues, including a possible return, if needed. All of my items are from a smoke free environment. Care is always taken when packaging for shipping. All items are shipped same day or next day of your order. Always Fast, Free shipping.